The Gifmator app for iPhone helps you create and share animated gifs with simple navigation and intuitive functionality. With the help of the Gifmator iOS app, you can produce animated gifs from an in-app still shot camera, an in-app video camera, and your photos and videos in iPhone and iPod Touch libraries. 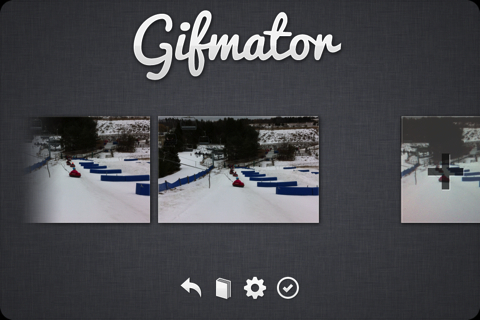 The Gifmator iOS app home screen provides three choices: create an animated gif, check out your gifs, and Gifmator help. The Gifmator help is a leather bound e-book containing information ranging from gif history to the Gifmator iOS app’s tools and tricks. Using gesture controls, you touch the section you want to explore in the table of contents and you’re transported immediately to the section. The Gifmator iOS app has simple, straightforward interface, so extensive help is not necessary for those familiar with iOS photography apps. You can make your animated gifs from an excellent screen with the three options in a vertical column on the right side of the screen. At the top, you can select photos and videos from your iPhone library. To create an animated gif by shooting a video from within the Gifmator iPhone app, you touch the video camera icon at the bottom of the right side of the screen. The interface for shooting still shots from within the Gifmator iPhone app is exceptional and accessed by touching the camera icon in the right side of the screen. You can take snap shots in fairly rapid succession, and once complete just touch the left side of the screen. You scroll through the photos using finger swipes. If you use an existing video or one created within the Gifmator iOS app, the frames are quickly extracted for you to edit your animated gif. You scroll through the frames or photos using finger swipes. 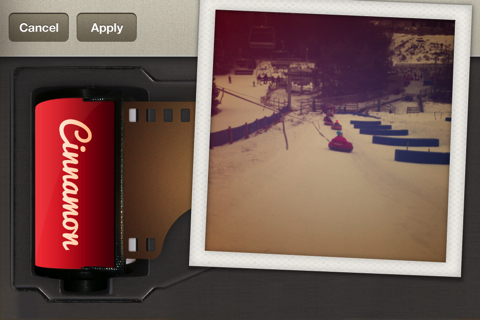 A tap on a frame or photo allows you to add an effect, delete, or expand. The effect can be applied to just one frame or all of the frames. The effect produced by the Gifmator’s iPhone app is extremely subtle, so fans of dramatic filters and effects for iOS photography may be underwhelmed. Your completed animated gif can be shared with Tumblr, Twitter, Facebook, email, and SMS text message with one touch. Unlike other popular iOS app for creating animated gifs like Gifture, the Gifmator iPhone app does not require you to participate in a social network. This is a workhorse iOS app, as it is focused on simply producing great animated gifs easily shared to your existing social networks. AppSafari review of Gifmator was written by Jenni Ward on June 28th, 2012 and categorized under App Store, Photos, Video. Page viewed 4133 times, 1 so far today. Need help on using these apps? Please read the Help Page.